Meal prepping is one way to eat healthy and take the stress off of planning your meals throughout the week. 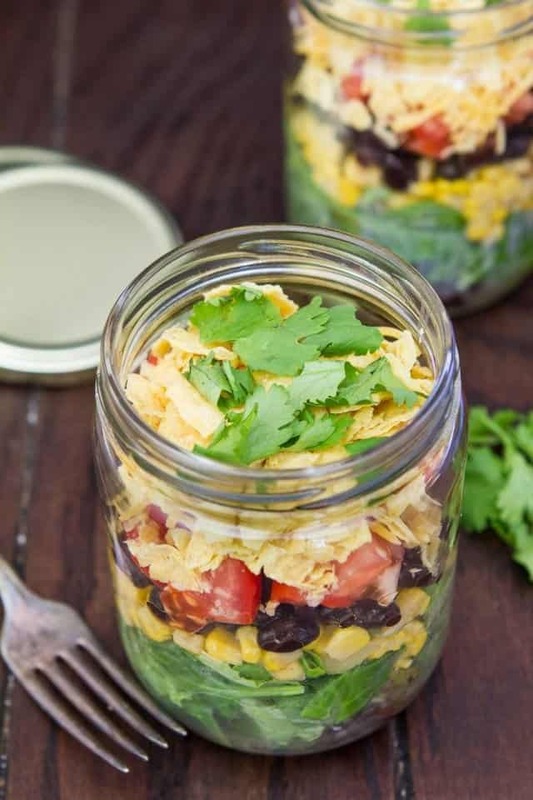 These 15 meal prep recipes will prepare you for breakfast, lunch, and dinner. 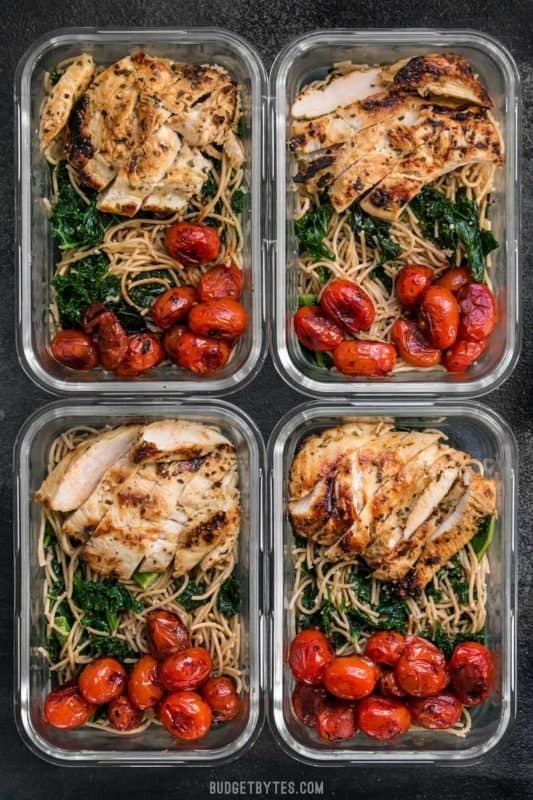 You might be thinking meal prepping takes way too much time and effort. Well, luckily there are companies like $5 Meal Plan that make meal planning for the week easier than ever. If you are interested in learning more about meal prepping and saving money come join us at The Savvy Couple Community on Facebook. 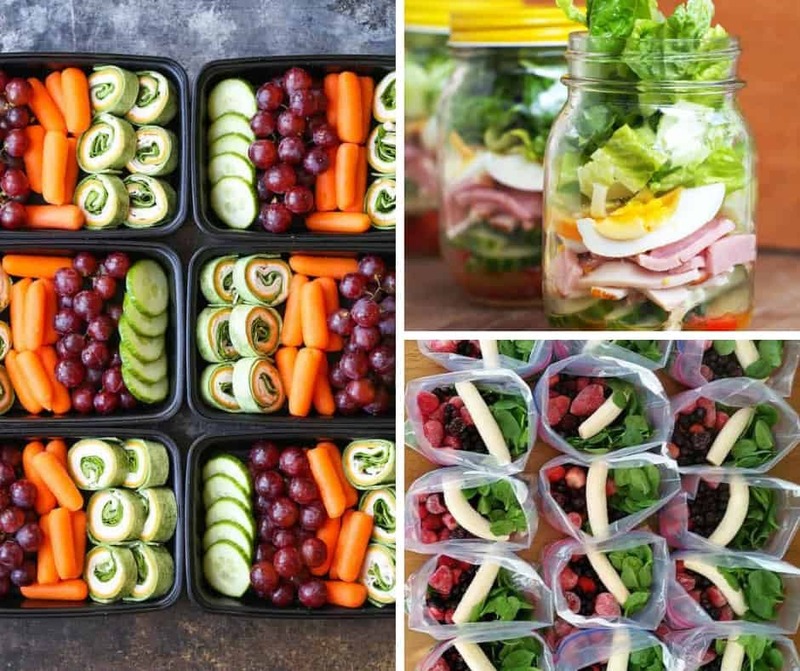 If you are new to meal prepping, check out this beginners guide to meal prepping. It will help you get started. 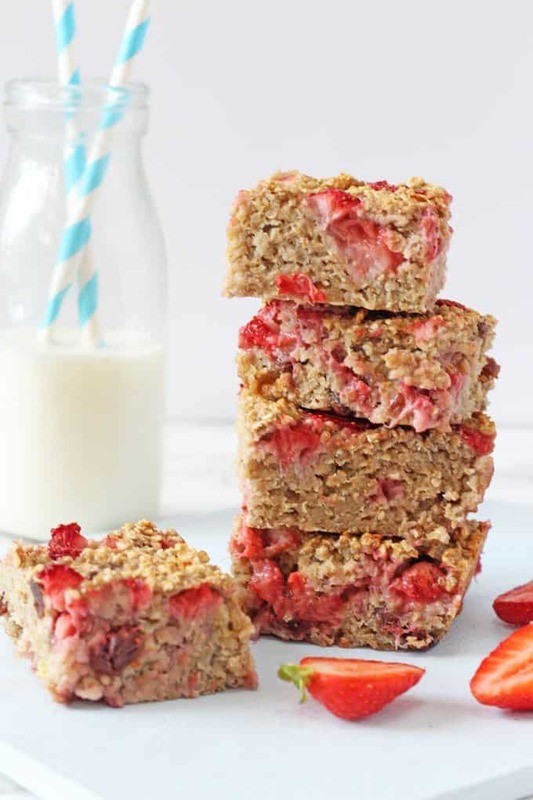 Then come back here to make some of these healthy recipes! The next section gives you a little look at “how to” in a nutshell. How Long Can I Keep Meal Prep Meals in the Fridge? First thing’s first – you’ll need some good containers to store your meals in! This set on Amazon is a great starter kit for beginner meal prepping. You can use them in the freezer, refrigerator, and dishwasher! Alternatively, you could use something like mason jars or definitely Tupperware containers that you already have! #savvy! Plan out your shopping list, taking it meal-by-meal. This will help you not only make sure you don’t forget anything for your meals, but it will keep you focused so you can better keep your grocery budget in check. 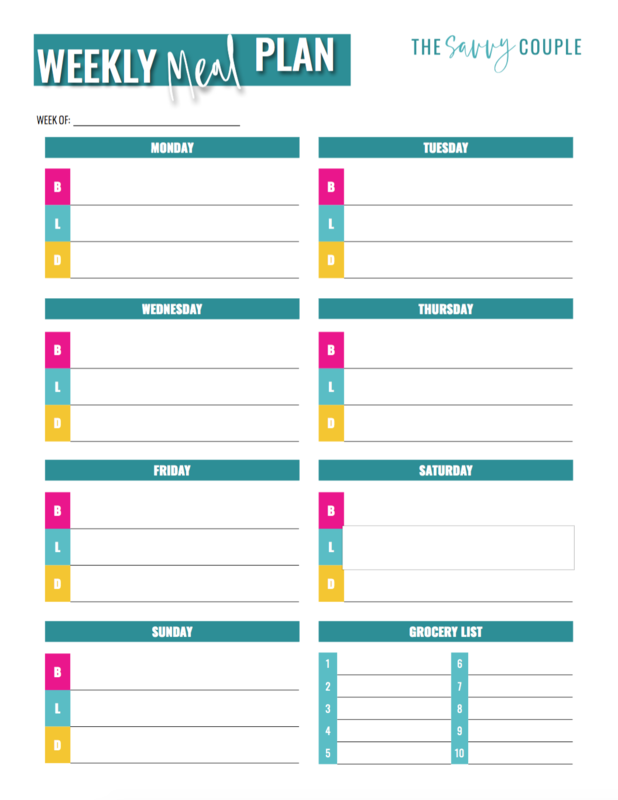 I found a weekly template online and I printed it off. I placed it in a plastic sleeve to re-use week after week with a dry erase marker. If you are a beginner meal prepper, you might want to buy frozen or canned fruits and vegetables. The nutritional value is comparable to fresh, you’ll have less prep time involved with no longer needing to wash them before use, AND they’re often cheaper than fresh, too! Something that saves time AND money is a big win! Don’t overlook some non-food time savers, like using a quality rice cooker or an Instant Pot to make a large batch of your grain quickly! This goes for both foods and containers. 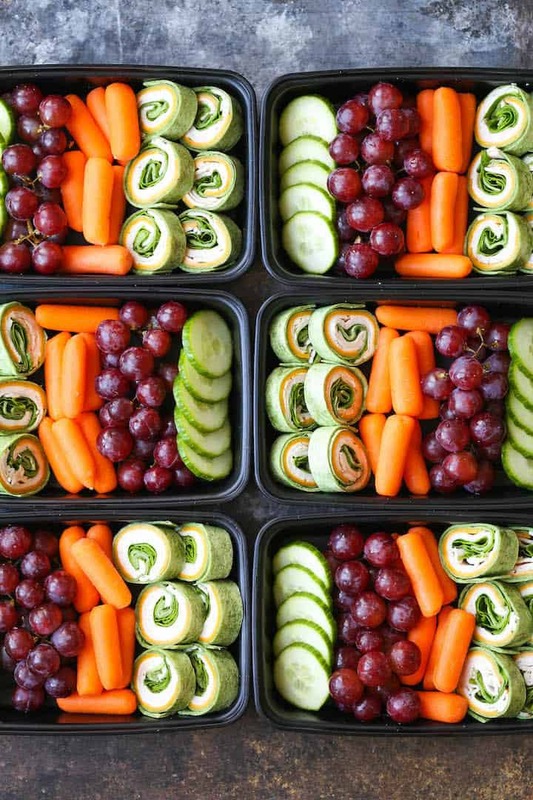 Before you start your actual meal prep, do a little pre-work to make sure that your produce is washed and ready to use (clean produce lasts longer than unwashed produce, too! ), as well as having the containers washed and ready to go. Nothing will make your meal prep feel cumbersome quite like these avoidable interruptions! 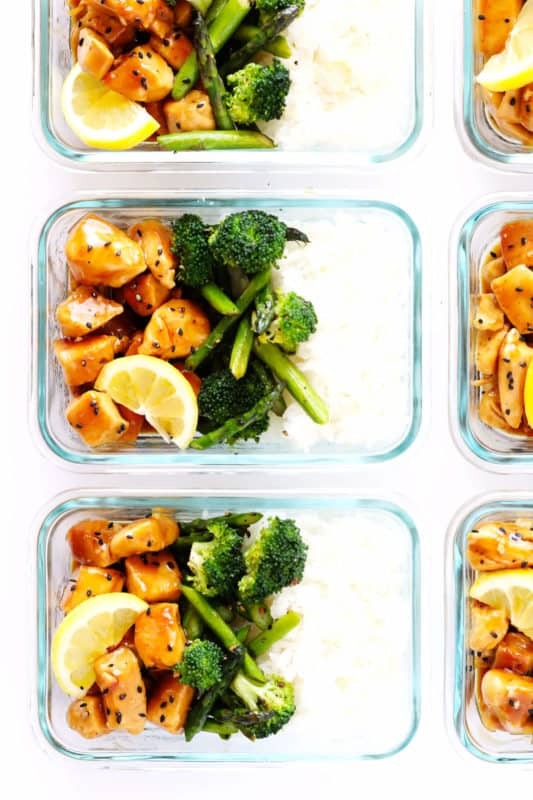 While meal prep is a super easy way to save yourself time during the week, it’s also really easy to get yourself overwhelmed when you’re first getting started. The last thing you want to do is spend time making a bunch of food only to end up wasting it. Choose a handful of recipes that you know you’ll love and can easily spice up here and there for extra variety. 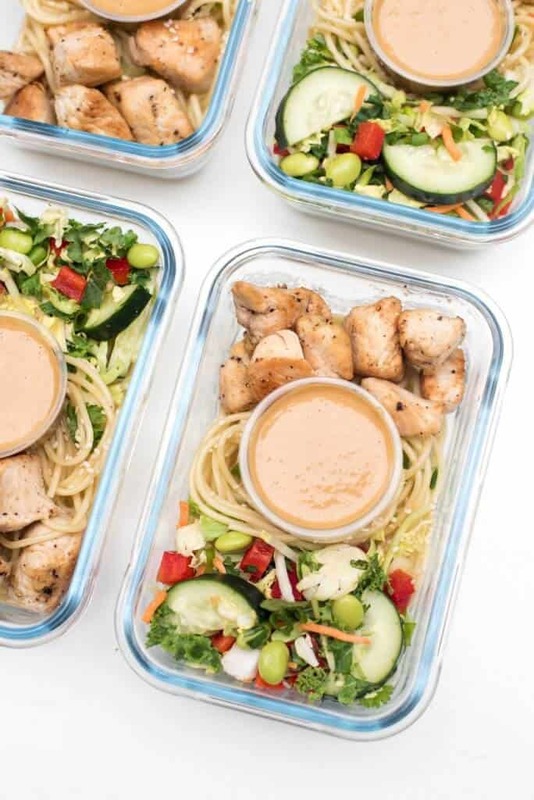 Don’t underestimate the power of buying a store-made rotisserie chicken either – for just a few dollars you can have half the work of meal prep done for you, which still saves you a TON of money and will help you “get in the groove” of doing weekly meal prep! It’s too easy to think this is a quicker task than it is. True, while it saves a ton of time to batch-cook multiple portions of a meal at once, it still does require time, period. So to make sure that you can actually get your meals prepped and your week set up to be smoother, make it a point to block out and hour or two every Saturday/Sunday (or whatever consistent day of the week is best for you) to do all your prepping and portioning. Set a reminder in your phone if you have to! 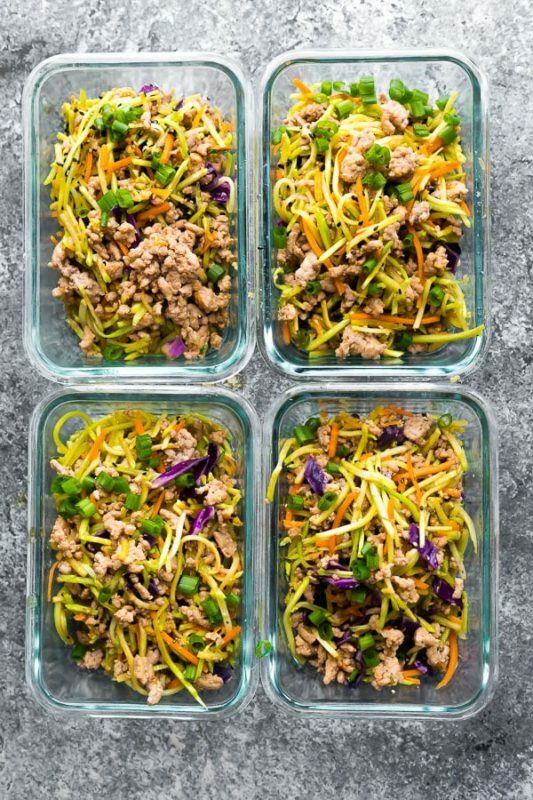 Don’t think of your prepped meals as anything different than normal leftovers. The standard advice is to only keep leftovers for 3-4 days tops, and more like 2-3 days if they include seafood (think shrimp). 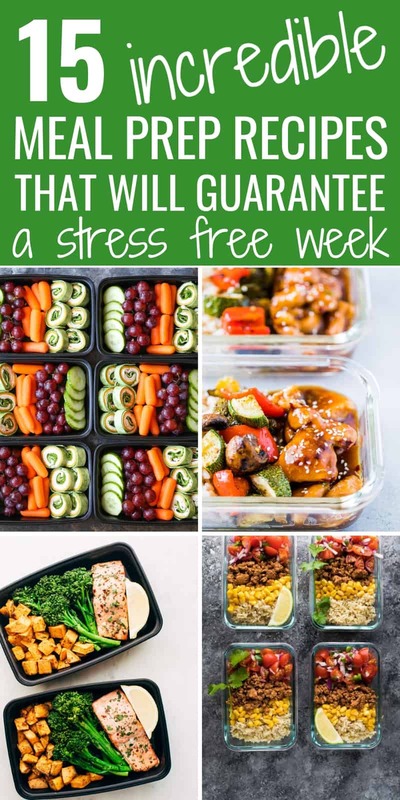 Because of this, the best advice is to start simple with your meal prep, but work your way into doing your prep twice per week if possible, to make sure you’ve got the freshest meals possible. Think about it; let’s say you’re working on some of your meal prep ideas for your lunches for this week. You’re super excited about being able to take a “real,” filling lunch instead of just a boring old sandwich or wasting money on to-go food. 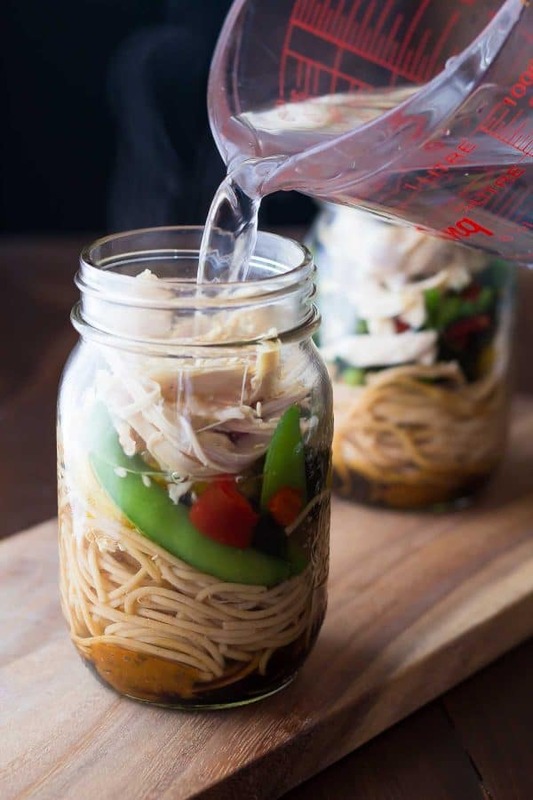 You do a bunch of cooking (enough for multiple servings of each recipe), BUT you’re splitting it up into small, ready to grab-and-go lunch containers. First, there’s a limit to what one of your containers can hold (so make sure they aren’t too big! ), but even better is that you can try your hardest to stretch one extra meal per recipe if you really wanted to, and just bring a snack portion of a zero calorie food to help you feel full. You won’t even miss the small amount you have below the serving size! Healthy smoothies are one of our favorite meal replacements because they are super yummy and so fast and easy to make! You can portion out the ingredients each night for your smoothie for the next morning, or you can portion it out for the entire week at once! Then in the morning you’ll just grab the appropriate containers, dump and blend, and head out the door! Alright, you’ve got enough background and you’re ready to get going. 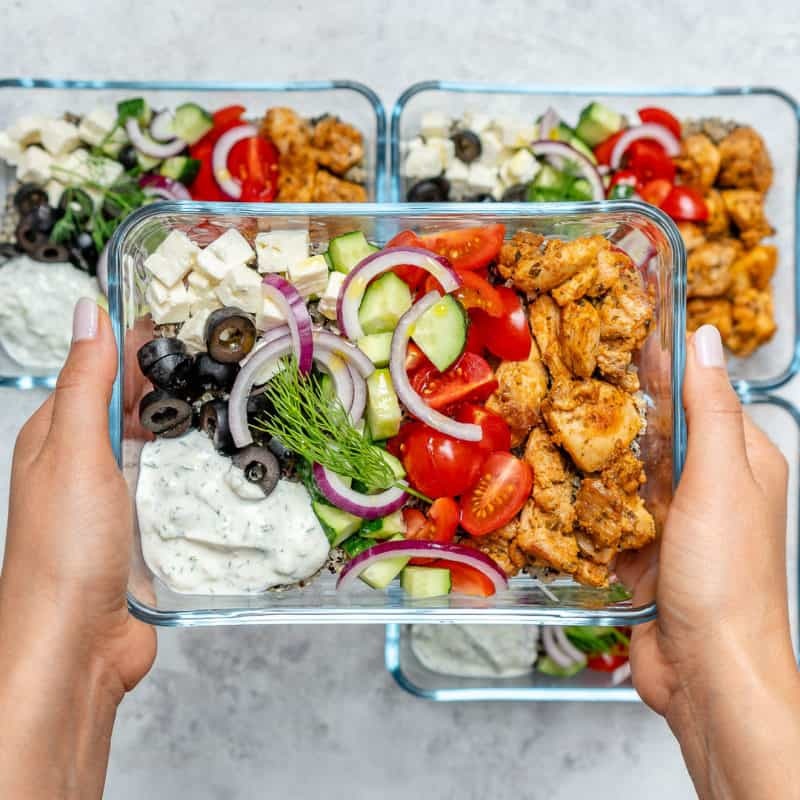 Let’s jump right in with delicious meal prep recipes that are simple, well-balanced, and definitely going to become fast favorite recipes for your family! Why not start right at the top?! You might not have known that you can even meal prep your breakfast. But hey, if Jimmie Dean can freeze breakfast sandwiches, you can definitely come up with something MUCH healthier (and cheaper) at home! With great flavor and lots of good protein, a well-made egg breakfast is one of the best ways to start your day off right! When I first started meal prepping, these were my breakfast go to! They are packed full of veggies. To put them over the top, I would add chunks of avocado. You can’t beat these for breakfast for around 50 calories a muffin. Gone are the days where you’ll need to stop at a coffee shop or McDonald’s for your soggy breakfast sandwich or a boring bagel to eat in the car. Grab one of these hearty containers from your fridge, warm it up while you make your cup of coffee, and enjoy! If they can sell breakfast bowls at the grocery stores, then you have no excuse why making one isn’t a great idea! Now you can have yourself a hearty scrambled egg breakfast every morning, even when you’re running super short on time! 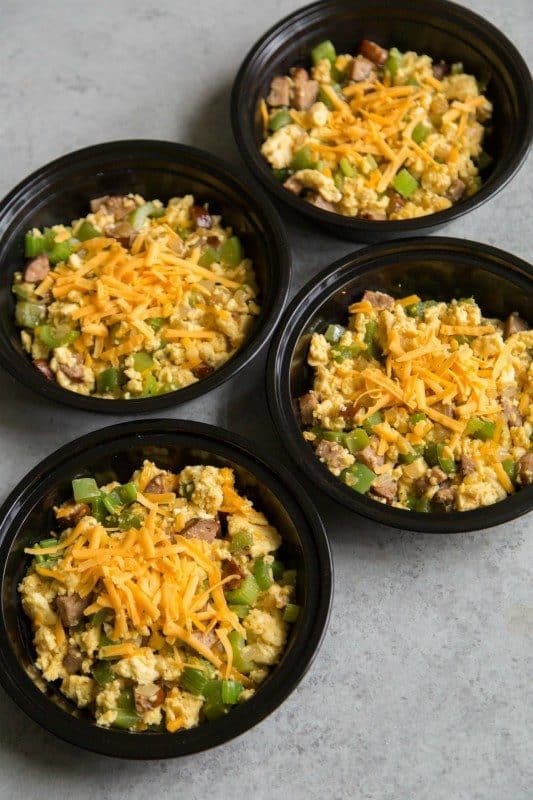 These might be the ultimate family egg breakfast meal prep idea, because you can easily adjust what size your bites are, making larger ones for adults and smaller ones for little kids. 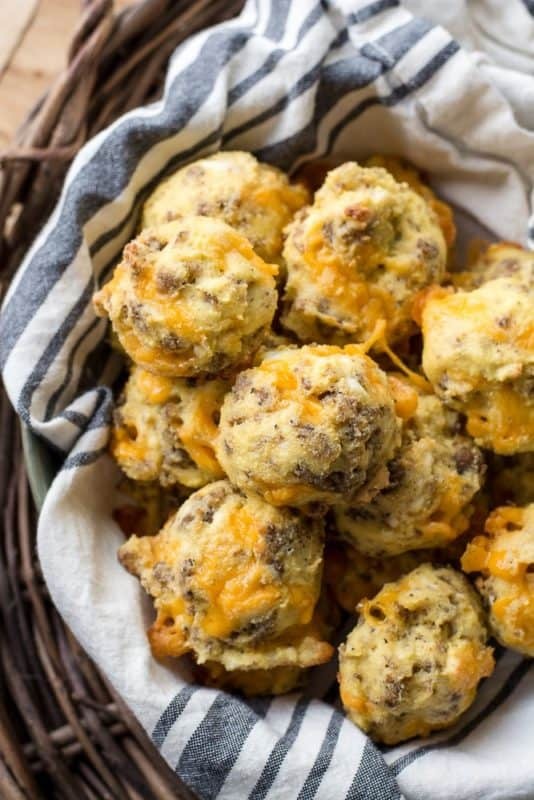 Just put a few of these warm bites in a ziploc bag and your kids can have a great breakfast as they run out the door in the morning! Eggs not your thing? 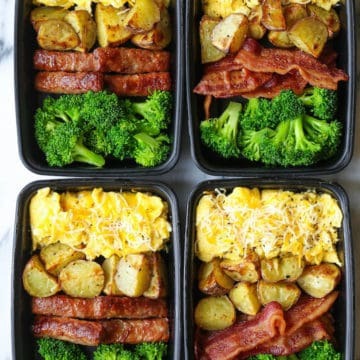 You can still make excellent meal prep ideas for breakfast, easier than you think! 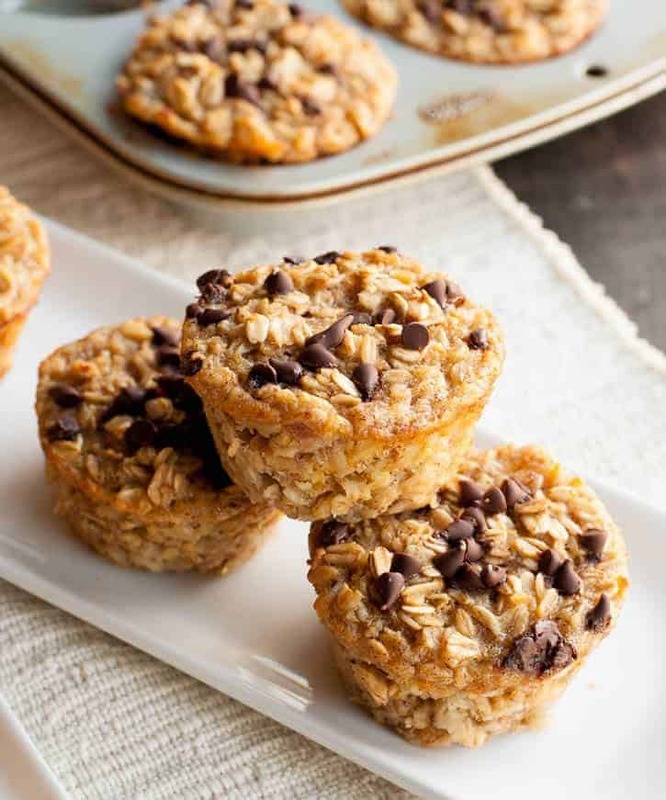 Try some of these oatmeal-based recipes to make your mornings feel less busy! Who knew that eating healthy could taste so sweet! I love the combination of chocolate and banana. You will not even be able to taste the oatmeal. We are all busy! That is why meal prepping is so perfect for people on the go. 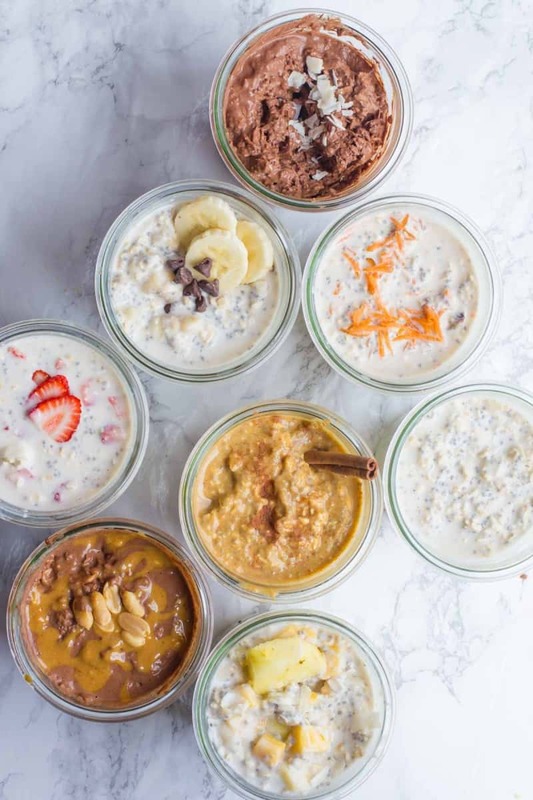 These overnight oats can be prepped in mason jars the night before. There are so many different flavors and combinations that can be mixed together. Give these a try! If you have not used quinoa in your recipes yet, you need too! I love quinoa and all of the health benefits it has to offer! 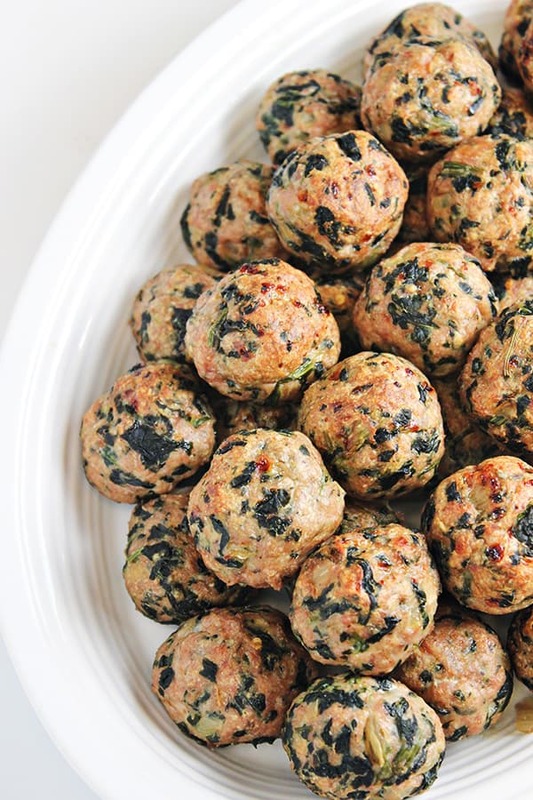 Make these for the week and portion them out for your work week. They could even be enjoyed as a healthy dessert if you are craving something sweet. Why not consider starting your day with an incredibly delicious meal, packed with vitamins, minerals, and a few servings of fruits and veggies! We even made a list of our favorite smoothie recipes that you could use for even more easy meal prep ideas! 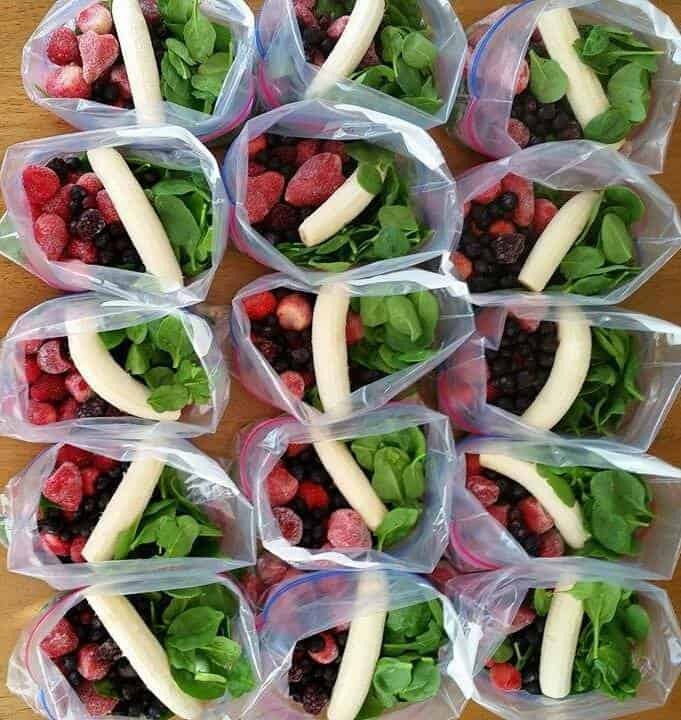 Smoothies are super easy to make ahead, bag and freeze. In the mornings when I was rushed, I would throw a smoothie mix into theNutriBulletand move on with my morning. Such a good decision compared to going to a drive through. 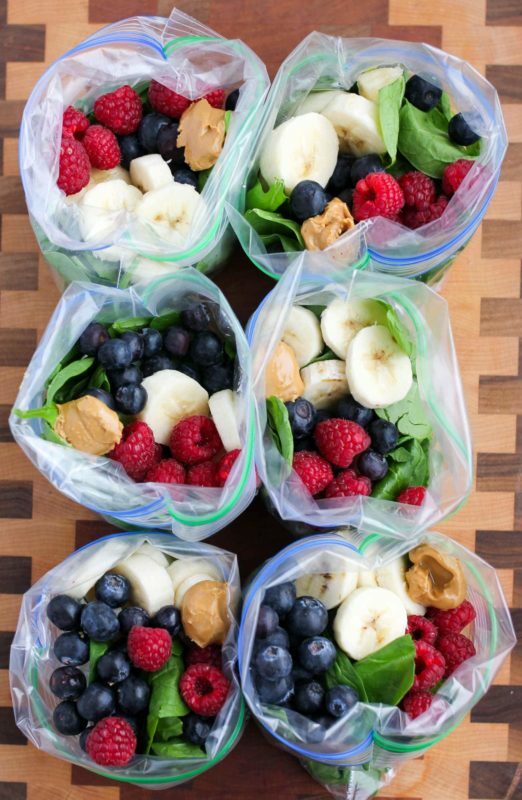 With a little peanut butter for extra protein and an extra creamy finish, these dump-and-go smoothie preps are the perfect way to start your morning! If you’re lucky enough to have access to a blender during your lunch, then taking one of these with an ice pack would be a great way to get a highly nutritious to-go lunch without spending a fortune at a smoothie shop! With healthy greens, tons of flavor, and a super easy prep, you really don’t have any excuses to not have a breakfast smoothie every day! These look so delicious as a fresh mixed portion, you might even find yourself having a bowl as a snack or small lunch without blending! 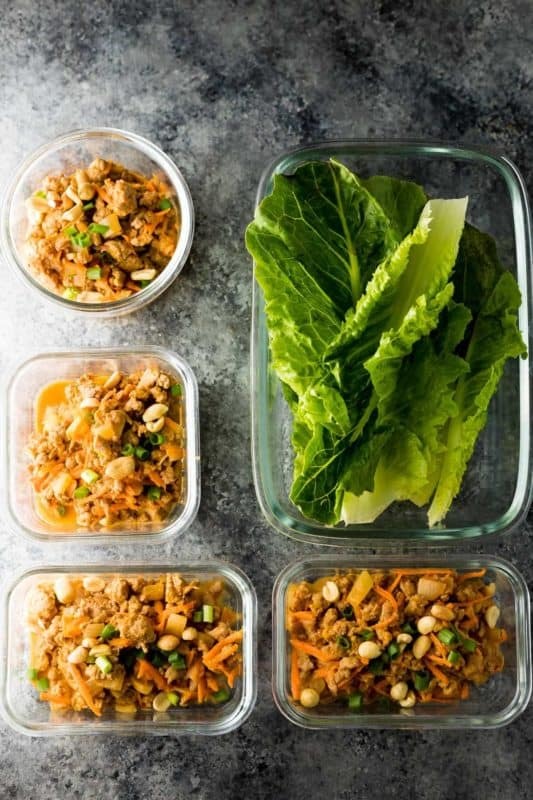 These two meals are combined on this list because many people are fairly used to using their dinner leftovers as the next day’s lunch, so any of these meal prep ideas could be used for either meal! For an easy-to-read list, they’re split up into salads, soups, and then by main meat ingredient. We’ll start light with some salad recipes. Yes, you really can eat healthy if you put just a little effort in ahead of time! At work, I like the flexibility to hold my lunch and work at the same time #TeacherLiving. 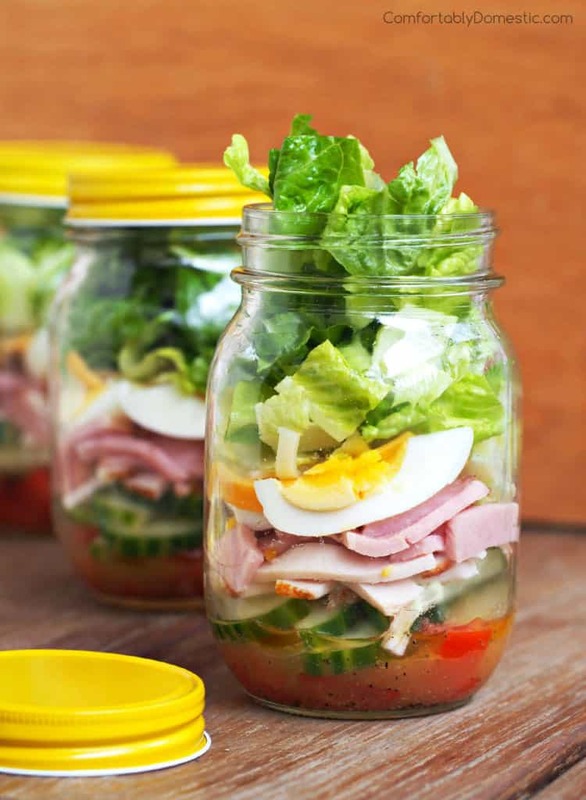 These mason jar salads are perfect for lunch. Great for storage and to hold during lunch time. I love Wendy’s taco salad. This is a great healthy alternative that you can easily prep ahead of time. This is a great meatless option for vegetarians as well. 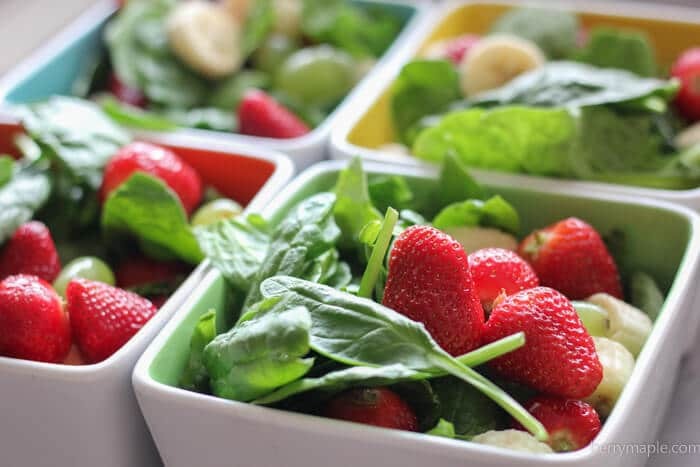 Nothing says “weight loss” like eating a salad for lunch every day, but who has time to make a less-than-boring salad each morning before work? 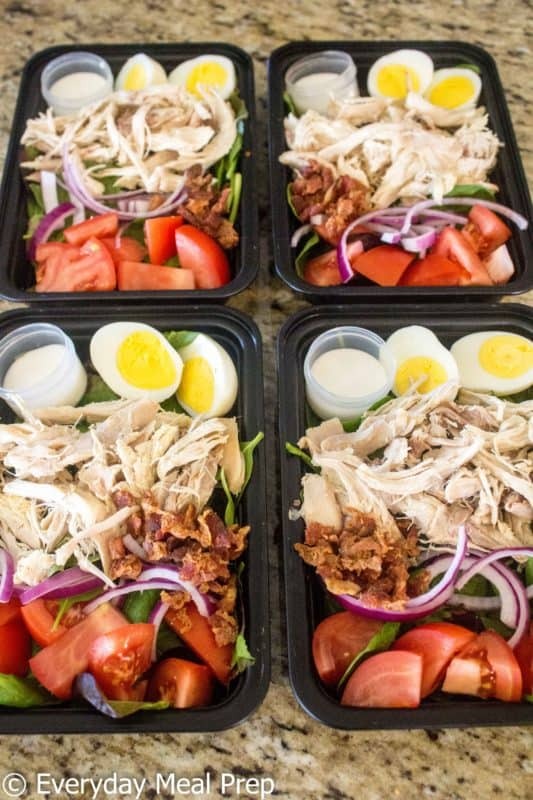 This cobb salad meal prep recipe is sure to taste better than any grab-and-go salad you could buy at a store, too! Who doesn’t love a nice warm, healthy bowl of soup in the cold of winter? This is far better for you than any soup you can buy at the store! I am a sucker for Instant Noodles! How easy is it to place the cup of noodles under the Keurig and you have hot soup in minutes! Those soups are so bad for you and the sodium is insane! This is the perfect option to keep your belly warm and your body will thank you. Here’s a recipe for a hearty soup that’s sure to satisfy any eater! It’s a perfect recipe to experiment and make it your own – tweak it to be taco or chili flavored, or replace the potatoes for pasta and cheese to make it more like lasagna! 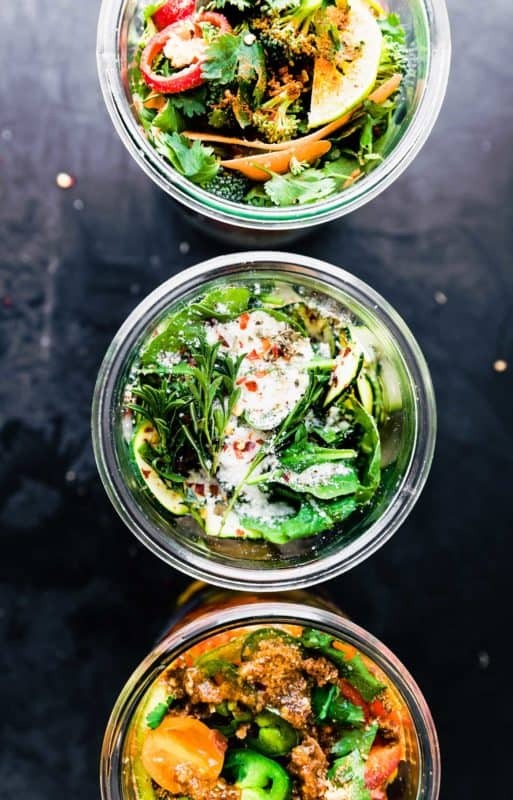 If you’re in love with those instant soup cups but always wish for a little more flavor and spice with them, then here are three version to make that are anything but copycats of the store-bought cups! Need some meal prep ideas with turkey? Whether you’re using lunch meat in the summer, or leftovers from Thanksgiving, these recipes will make your week run smoothly! Turkey is also a great choice for a cheap meat to replace either chicken or ground beef, so feel free to get creative with your recipes! If you have read other recipes that we have talked about, you know we love to use turkey as a substitute for ground beef. Not only is it significantly cheaper, but it is also healthier. Mix it up with different meats. You do not always need to eat chicken every day. You can alternate between chicken and ground turkey to get some variety between your meals. This is a recipe we’ll definitely have to add to our collection of lettuce wraps recipes! It doesn’t get much lower calorie or lower carb (and tasty) than this! This is probably the most commonly used meat in meal prep ideas, primarily because it’s a healthy and lean meat, as well as one of the most affordable meats you can buy! 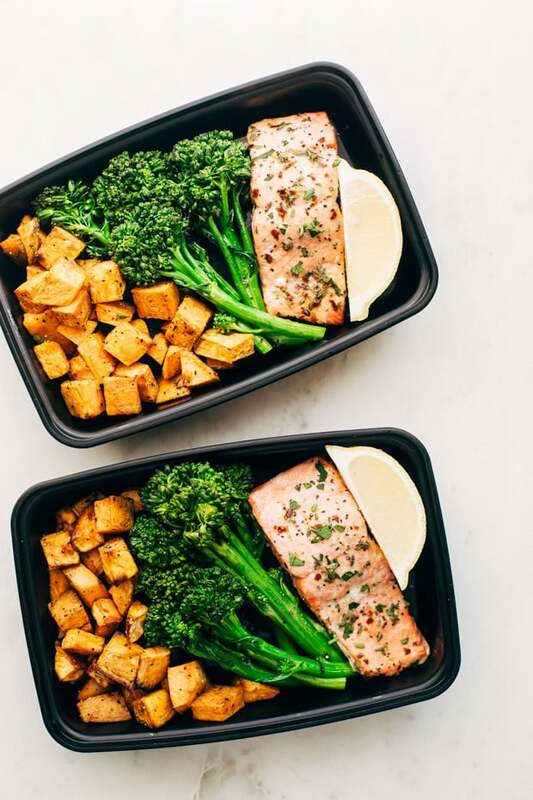 Valerie over at Valerie’s Kitchen knocked this meal prep meal out of the park. The peanut sauce looks divine! I love the mix of the noodles and salad too. Better than ordering Thai out! Can I just say those vegetables look so good! Stir Fry is a weekly meal at our house. We always say we need to make it more often. With meal prepping, we can! 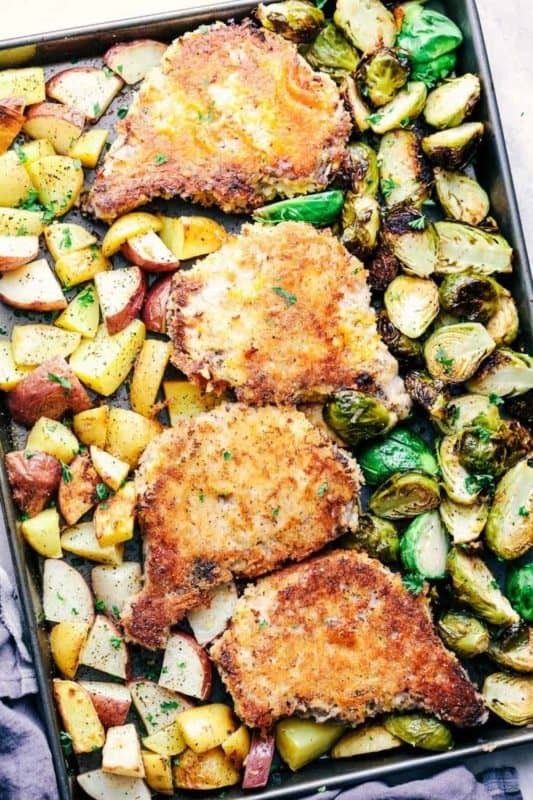 I love one sheet pan recipes! How easy is it to cook everything up and divide it between containers. The meal prep process just got easier! Imagine the cleanup for the week is all on one pan and done! Start getting used to seeing chicken in your meal prep future — it’s cheap, delicious, and incredibly versatile! This is a perfect example of a meal prep recipe where you could cook the chicken with fewer seasonings but modify it later to fit this recipe! This is another super healthy meal prep recipe, packed with good nutrition yet easy to make! 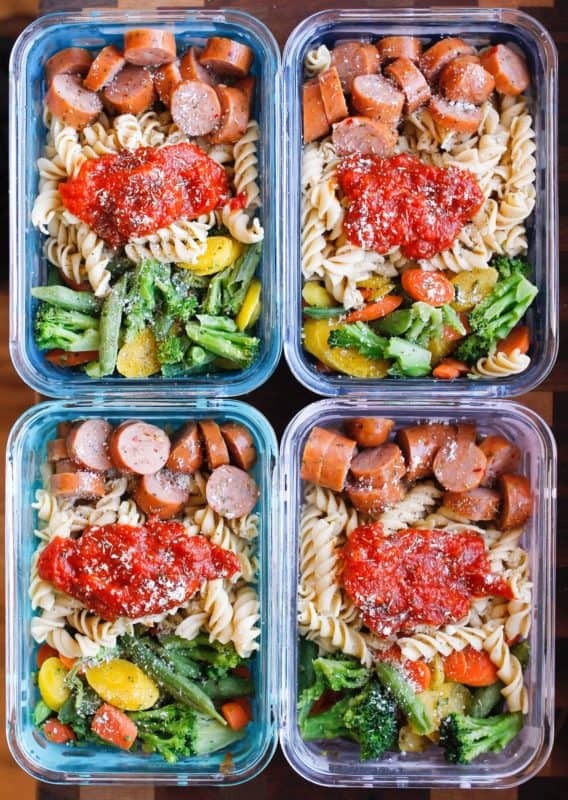 You could definitely swap out the pasta for anything, making this an awesome recipe choice if you’re looking for meal prep ideas to get toned! 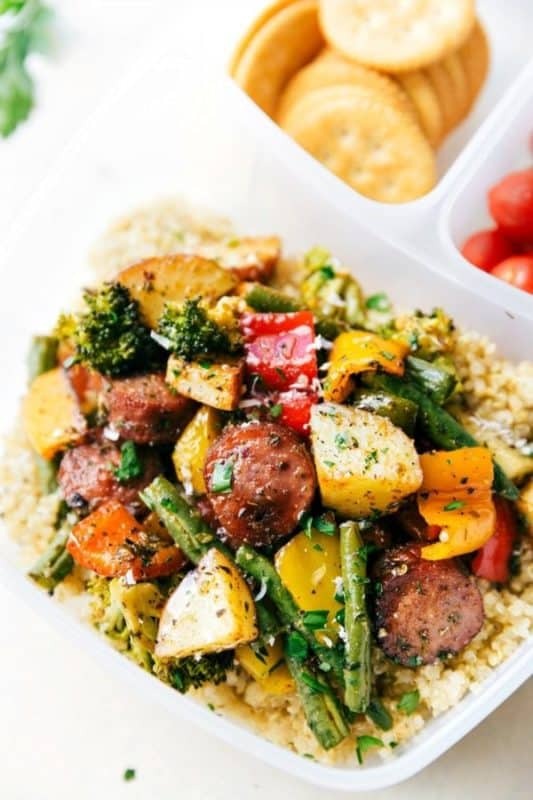 Quite possibly the ultimate meal prep idea to lose weight, this is such a tasty recipe focusing on proteins and veggies, with enough flavor packed in you’d think it was a MUCH higher calorie meal! Sometimes it’s the simplest foods that are the tastiest. 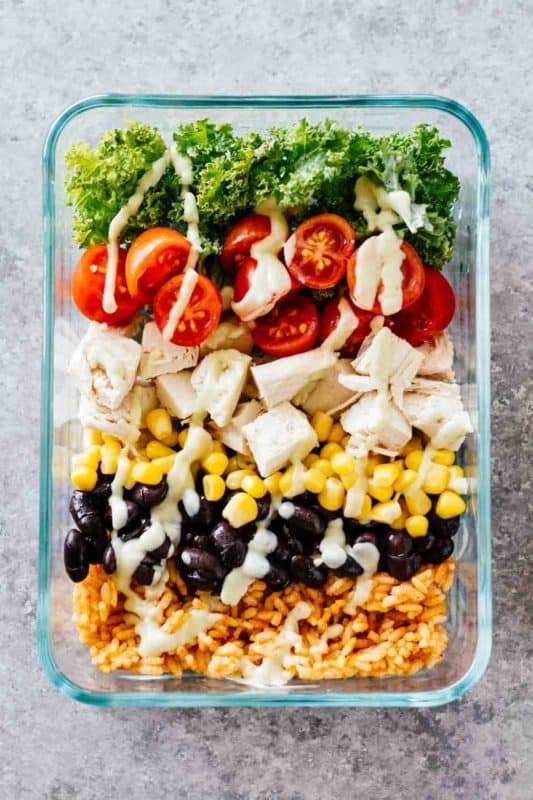 This is a perfect meal prep idea to take to work, since it’s filling but still light enough that you won’t spend the afternoon feeling over-stuffed and weighed down! Known as “the other white meat” with good reason, pork is a great meat to use for meal prep ideas. It’s lean but flavorful, usually more reasonably priced than beef, and super easy to cook! You need to add this recipe to your list if you’re looking for meal prep ideas to save money. It’s full of healthy veggies, and it’s so much cheaper than ordering out or buying pre-made egg rolls at the grocery store! Remember eating Lunchables as a kid? Here’s the healthy, grown-up version! 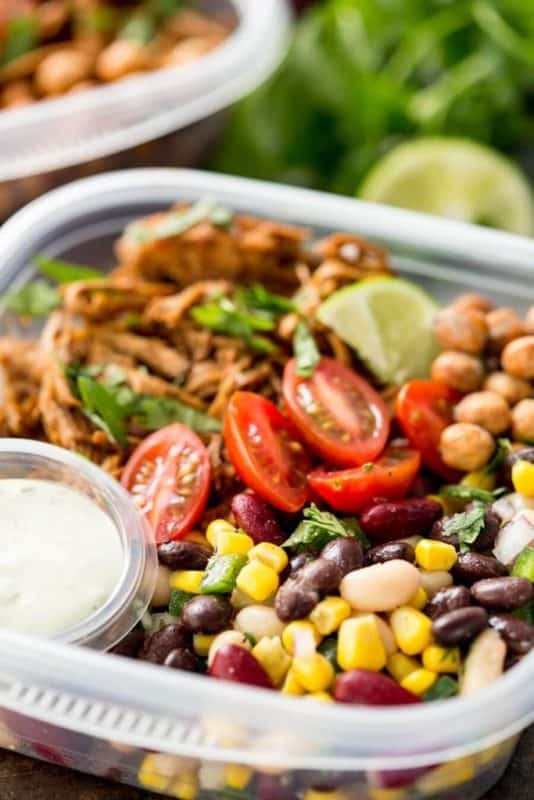 It’s ready in a snap, it’s an ideal meal prep idea for weight loss, and maybe the best part is you can eat it 100% on the go — no microwave required! While the recipe simply calls for “deli meat,” baking a hunk of ham in the oven and dicing it up for this meal would be an even cheaper (and nearly as easy!) way to get the same quality result but with less than half the cost! 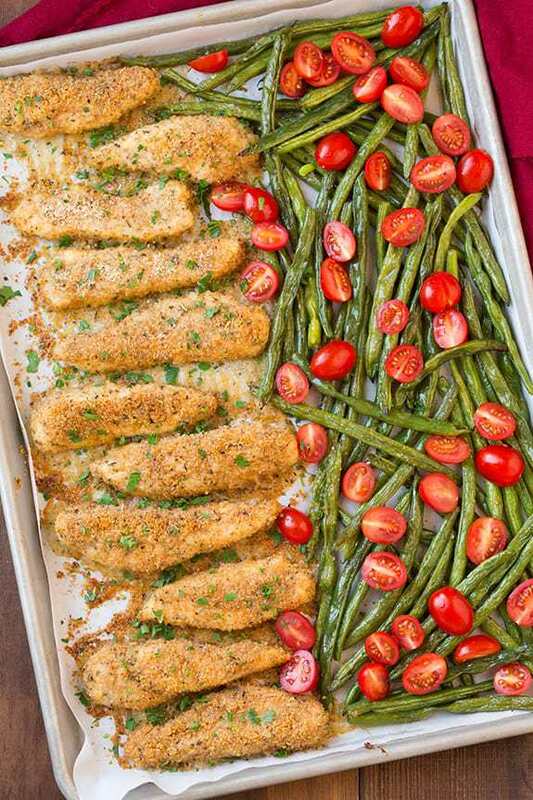 Sheet pan recipes are some of the fastest ones to make, because it’s a one-dish bake and done kind of deal! This recipe is full of flavor and nutrition, making it a delicious option for either lunch or dinner! This is a high-protein recipe that is perfect if you’re looking for good meal prep ideas for weight loss or for building muscle. Not to mention, it’s super delicious! Like a pulled pork sandwich without the roll, you’ll have a delicious meal that you won’t regret making! While beef is a slightly more expensive meat, it pretty much can’t be beat as far as protein content per serving goes. 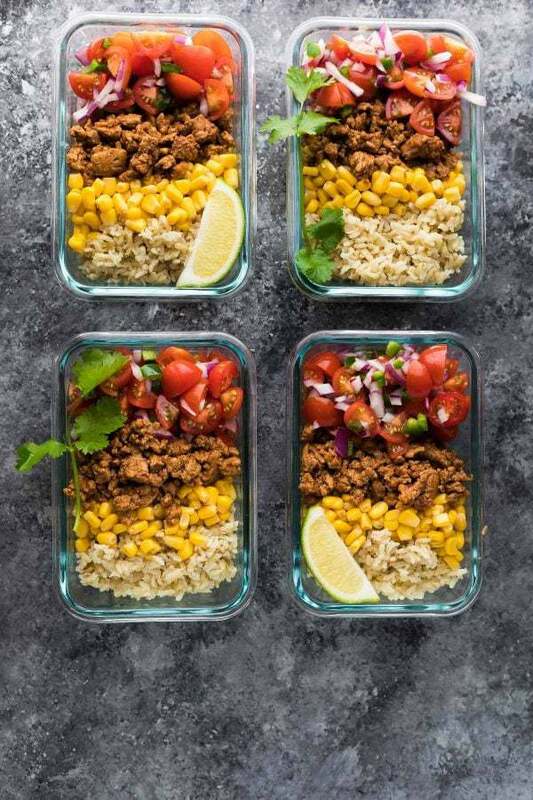 If you’re in need of meal prep recipes using beef, we’ve got you covered! I love that this recipe could just as easily be made with “regular” pasta to make it a slightly heartier dish if you need to, but as-is it’s SUPER healthy and low calorie! This is a great meal prep idea if you need to meal prep for people who have special dietary preferences or needs. 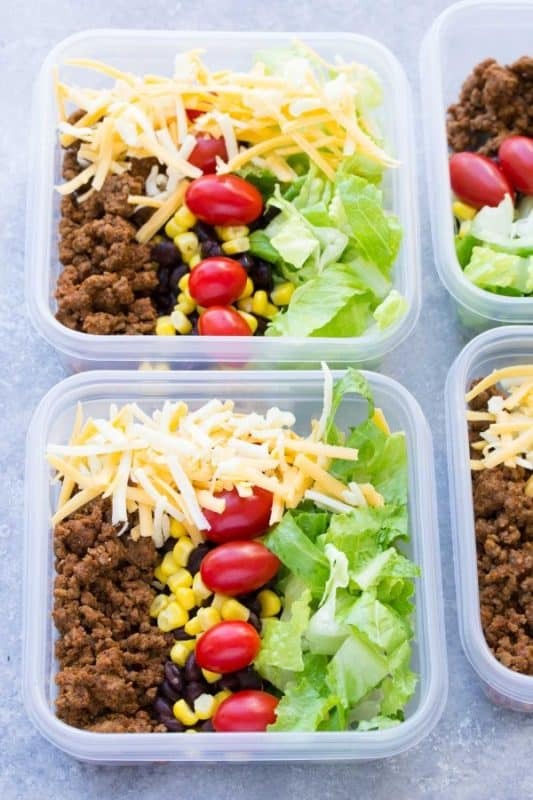 What would a meal prep ideas list be without a classic ground beef taco salad recipe? My favorite thing about this recipe is that it’s a perfect meal prep idea for kids, too! 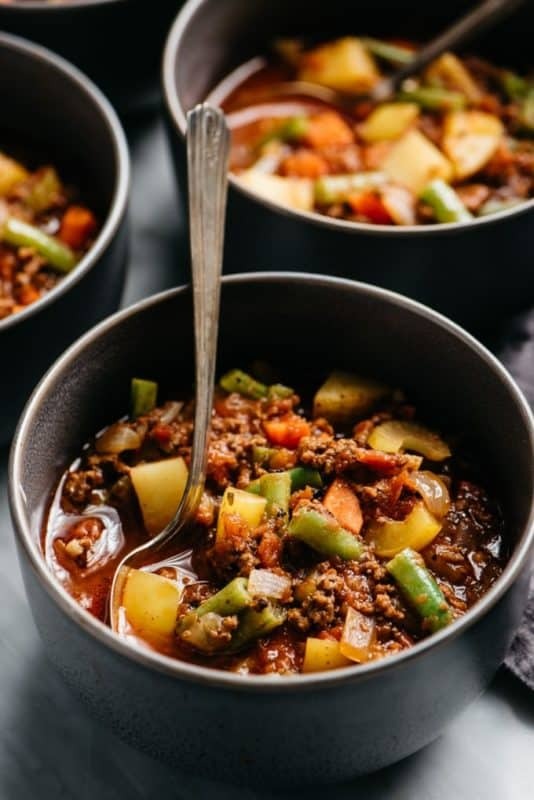 All you’ll have to do is brown the ground beef, chop any veggies, and let everyone craft up their perfect dish (plus you get a little help in the kitchen that way)! 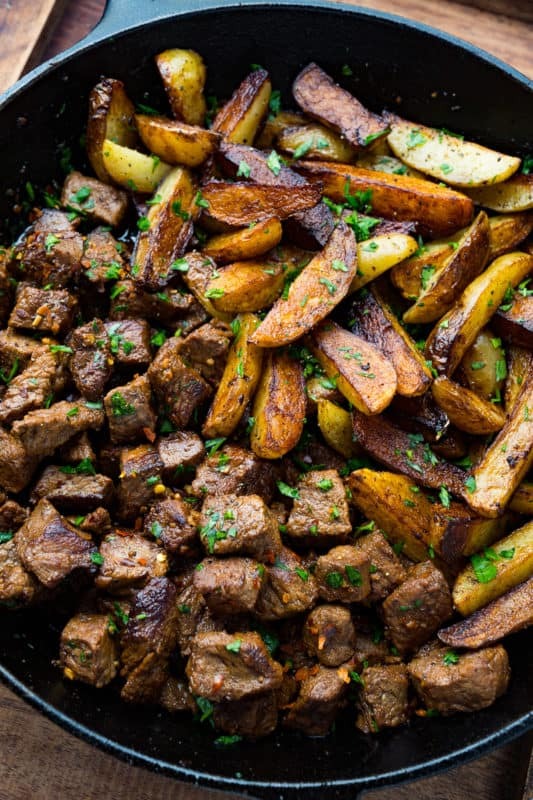 Steak is definitely one of those love-it-or-leave-it meats, but if you’re in need of a heartier dish for your meal prep recipes (maybe your husband isn’t feeling salads for lunch! ), then you have to give this meal prep recipe a try! Cook it all up in a skillet and portion into containers for a meal that’s sure to make co-workers jealous! 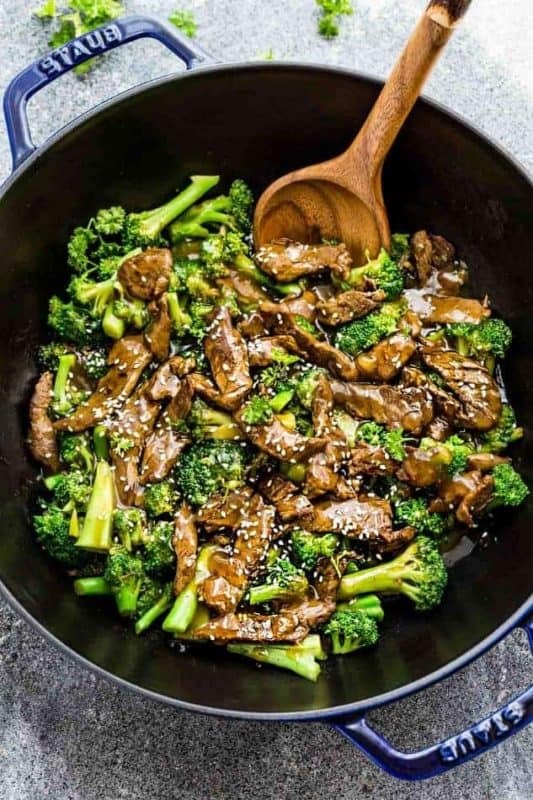 Beef and broccoli is pretty much a staple in our house. It’s affordable, delicious, and SO easy to make! Served over some white rice is our favorite way to make a simple meal prep idea that we really don’t tire of! Although these recipes may have a particular type of sausage called for in the recipe, it wouldn’t take much to swap it out for your favorite type of sausage instead! 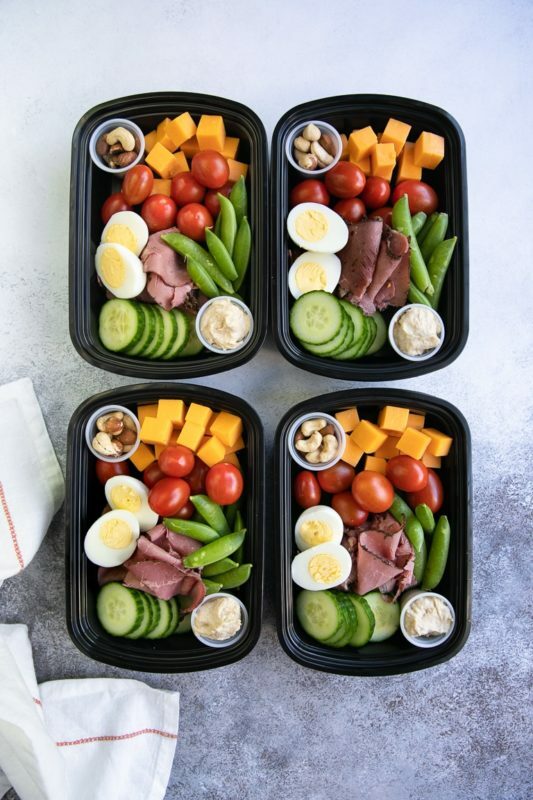 Not only is this meal prep idea a great way to keep your week running smoother, but with such a quick prep time it’s about as close to perfect as you could get! 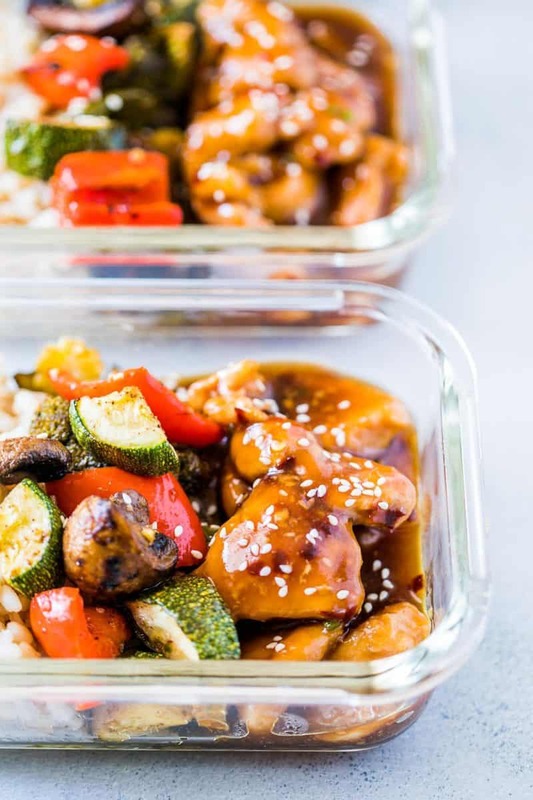 This recipe is a perfect way to work on getting your veggie servings in for the day, and make a gluten-free meal prep idea! You could always skip the rice and double the veggies for a meal that’s just as filling but without the carbs! Looking for a recipe with a little more spice? 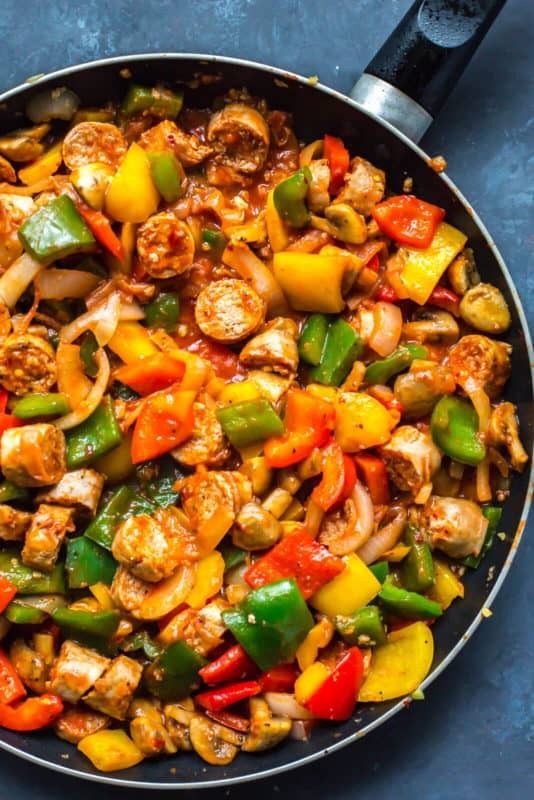 This recipe has a little bit of a Cajun feel to it, with spicy tomato sauce and a hearty peppers and onions mix with it! Whip up this quick dish in your trusty skillet, then portion out in containers for an amazing lunch on the go! 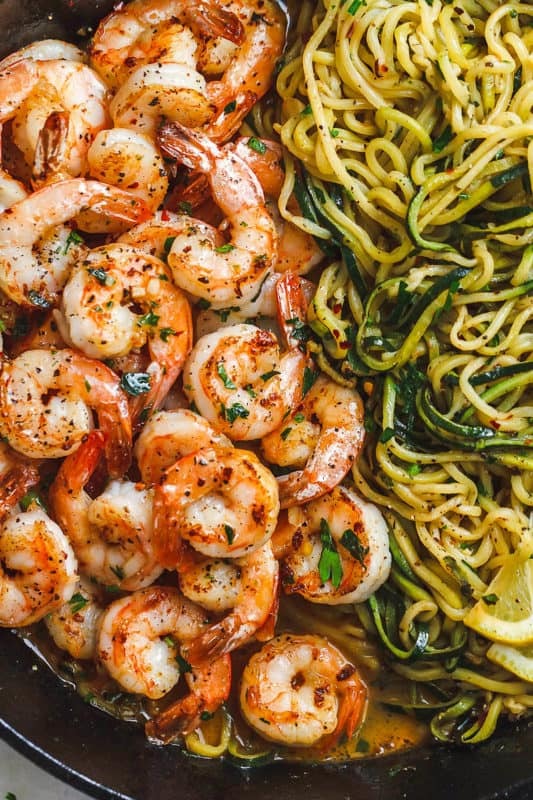 Not only is seafood full of good protein while being incredibly lean, but the extra nutrients it offers (like omega fatty acids) are incredibly good for your brain and your overall health! Meal prepping at its finest! Making sure you have a good balance of grains, vegetables, and proteins. Buying the pack of salmon can get you through dinner for the majority of the week. 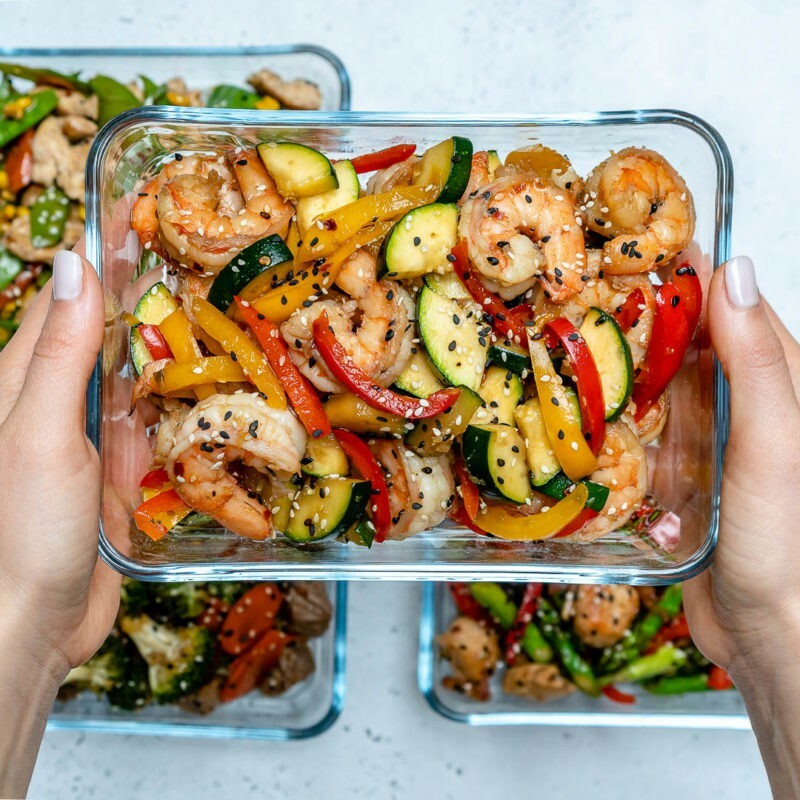 If you’re looking for a meal prep idea with shrimp, you’ll definitely want to give this recipe a try. Something about a dish full of colorful veggies always makes it so much more appetizing! Seriously, how delicious does this one look?! 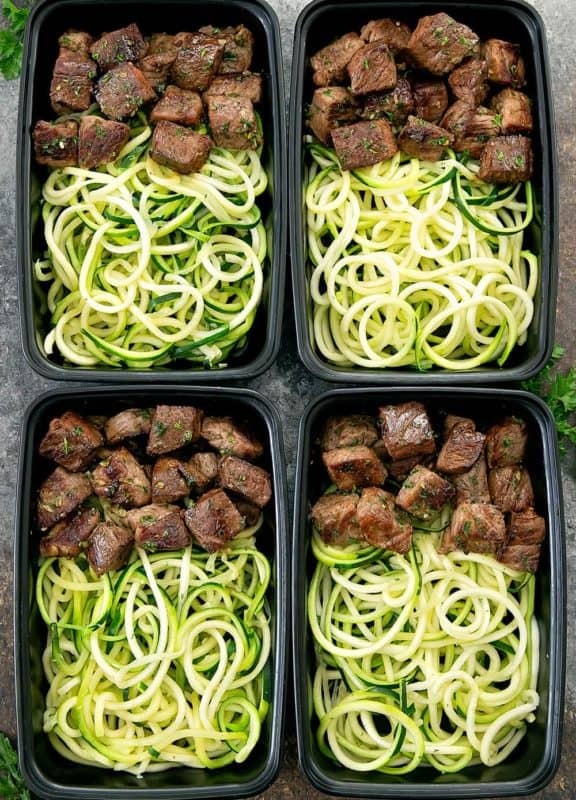 Leave it with zucchini noodles for a super healthy, low-carb recipe, or replace them with regular pasta if you’re looking for something with few more calories. Either way, this is sure to be a meal prep recipe hit, with such a fast cook time! Always remember meal prep recipes do not have to be boring. You can bring variety into your meals, as easy as just changing what meat you use! We love using $5 Meal Meal for creative recipes sent right to our email each week. When you meal prep once, your life will be changed! 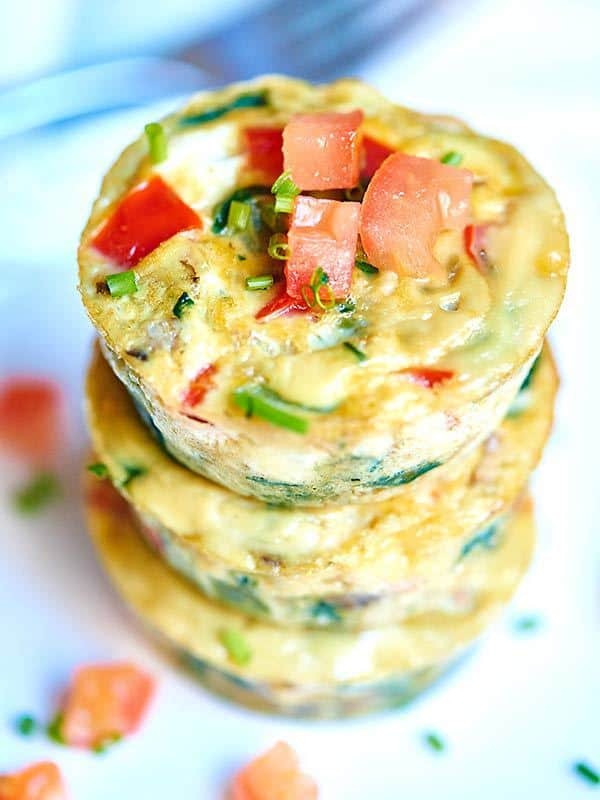 If you are overwhelmed with meal planning for breakfast, lunch, and dinner just focus on one! What is your favorite meal prep recipe? An informative article provides so many ideas for cooking lover like me. Just want to send many thanks to the author. I try now. Thanks Mandy glad you enjoyed all these awesome meal prep ideas!